Ice cider isn't apple juice on ice, it's a delicate, delicious, sweet liqueur made from frozen apples. It is a specialty of Quebec. Much like its sweet and complex comrade, ice wine, ice cider is made from frozen fruit. Apples are left outside—sometimes on the trees, sometimes on racks—to freeze in the naturally frigid winters of Eastern Canada. This slow process risks rot, to be sure, but when the weather cooperates it helps dry out the apples and concentrate their sugars before being pressed. 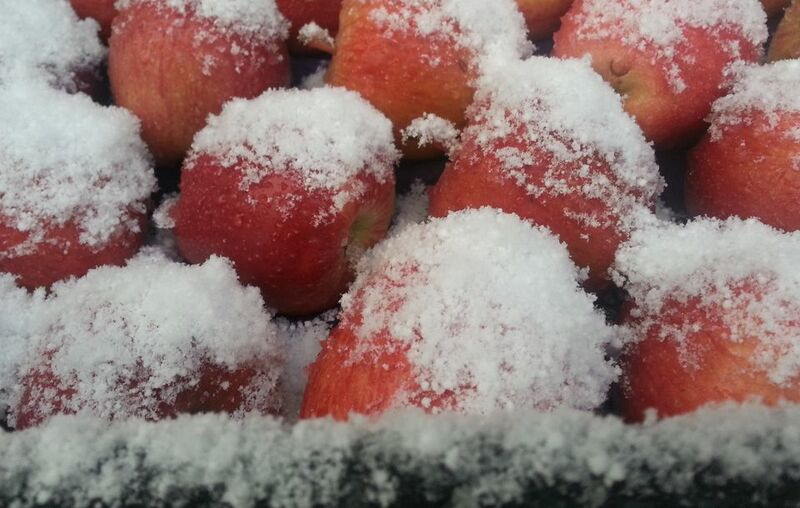 Pressing frozen apples is no easy business. They must be pressed very slowly to extract what juice is left of them (in a standard small apple press the process can take up to five hours) and, because the juices have become so concentrated, it takes 40 pounds of apples to yield just three liters of juice. What juice is obtained is then fermented into apple wine, or what is more widely known as ice cider. Ice cider is at its best when served chilled but not freezing cold. If it's served too cold the complex aromas will be lost and it will just taste sweet. For the right chill, put it in the door of a fridge or store it in the colder part of a wine cellar. Ice cider, like ice wine, is most obviously served at the end of a meal, often as a post-dessert drink to sip as the evening's conversation continues even though the eating is over. It is delicious on its own as a sort of a sipping dessert. If you want to give people something to chew, serve it with a piece of fruit or another dessert that is both slightly less rich and slightly less sweet than the ice cider. It goes well with pumpkin pie, for example, or other not-overly-sweetened fruit desserts. Yet ice cider need not be solely consigned to dessert. Its intensity matches remarkably well with super rich and fatty savory dishes, most particularly with foie gras or pâté. Ice cider shines best, in fact, when its intense sweetness highlights its opposite, bringing greater contrast and excitement to both. Whatever you serve it with, pour ice cider into small sherry or dessert wine glasses for the best bouquet and portion. Small amounts in larger glasses also work—just remember it is more intense and more alcoholic than wine or cider and should be poured accordingly.